1. Uprights will be extended to make them five feet taller. 2. Blockers cannot hit opponents in the side of the legs. The rule already prohibits hits to the back of the legs, and now language will be added to prohibit hits to the side of the legs as well. 3. Referees will be permitted to consult with the NFL officiating department during replay reviews via communication with the command center in New York. 4. 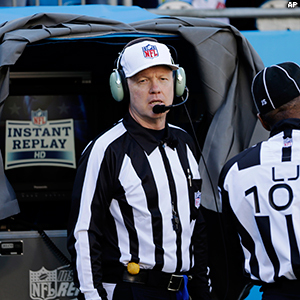 The recovery of a loose ball in the field of play will now be reviewable via instant replay. 5. The clock will not be stopped on a sack. 6. Defensive fouls behind the line of scrimmage will be enforced from the previous spot, not from the end of the run or the spot of the foul. Three proposals were voted down. Those were the proposals to move the kickoff to the 40-yard line, to expand instant replay to include personal-foul penalties, and to allow coaches to challenge any call other than scoring plays which are automatically reviewed. The remaining four proposals were tabled. Those were to eliminate overtime in the preseason, to put six cameras on all boundary lines to guarantee coverage for replay reviews, to modify pass interference so it can be called within one yard of the line of scrimmage, and to move one-point PAT tries back to the 25-yard line. The league’s owners will meet again in May. The league will experiment with longer PATs in the preseason. For Weeks 1 and 2 of the preseason, PAT tries will be snapped from the 20-yard line, making the kick a 38-yarder.